The Left exists as a fundamentally social movement. It says things that make social groups happy, like that everyone is equal so that no one must face negative social rank for his failings, and it spreads through social means, like Leftists hanging out from lack of anything better to do, planning how next to cause trouble. Among their recent fascinations, Leftists have found Confederate statues and plaques to be upsetting. They want these taken down because in their view, these are reminders of “white supremacy,” or at least, that is what they tell the newspapers. Their actual reasoning is far more subtle. 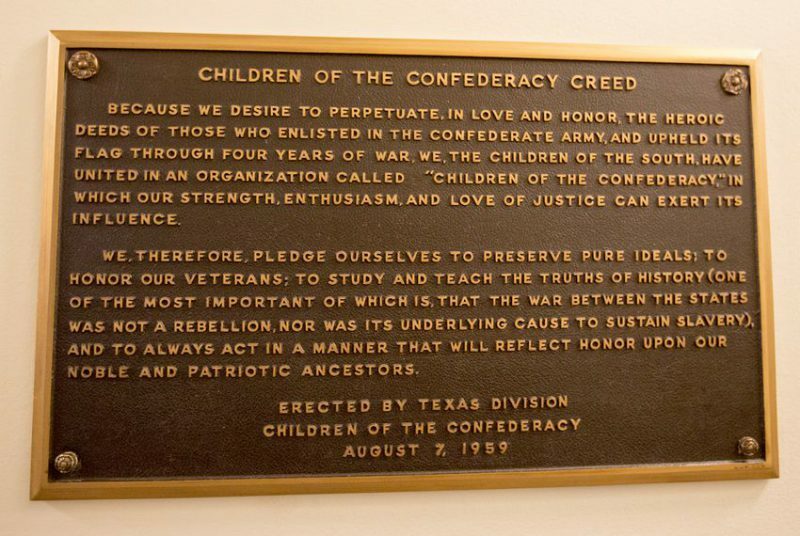 Because we desire to perpetuate, in love and honor, the heroic deeds of those who enlisted in the Confederate Army, and upheld its flag through four years of war, we, the children of the South, have united in an organization called “Children of the Confederacy,” in which our strength, enthusiasm, and love of justice can exert its influence. We, therefore, pledge ourselves to preserve pure ideals: to honor our veterans; to study and teach the truths of history (one of the most important of which is, that the war between the states was not a rebellion, nor was its underlying cause to sustain slavery), and to always act in a manner that will reflect honor upon our noble and patriotic ancestors. The Children of the Confederacy is a project of the Daughters of the Confederacy, Texas Division. …But outgoing House Speaker Joe Straus — who is a member of the preservation board — suggested there was no reason to send the debate to the Legislature. This leaves America and Texas both wondering what history we are going to teach. Is it that the war was about States’ Rights, and the resistance of an agrarian South to being owned by the creeping sprawl of industrial factories in the North? The Left says it was about slavery, but others say that slavery was merely a pretext to a deeper-seated conflict. Consider that Abraham Lincoln wanted a Marxist-style ideological government, or that the war may have been part of a wave of Leftist attacks across the West, or even a desire to avoid centralized government on the part of the South, which saw itself as carrying on the actual intent of the Constitution? It may have involved a desire to fundamentally transform the South from a place with culture to an ideological cult like the North, caused by its own internal ethnic diversity, in a struggle that reprises the conflict between Sparta and Athens over truth to principle versus obedience to popular will and its anointed, government? No wonder they want to erase history. They want to end the debate, and have everyone think like them, so that the ideological warfare can continue until we have completed our transformation into a Soviet-style regime where dogma is more important than reality.